Two words ‘shir’ which is head and ‘dhara’ which is sprinkling or pouring in a stream unites to form shirodhara. Therefore, the meaning of shirodhara is the pouring of medicine in liquid form on a stream over the client’s head for a specified time period. Considering the human beings in the form of an inverted tree, at the top, are the roots and pointing downwards are the branches. The root of this tree will be the man’s head. The trunk and the limbs will be thorax and abdomen. Much the same way the roots control and nurture the well being and activities of the tree, the human body’s operational center is the head. It controls the function of spinal cord and the brain. 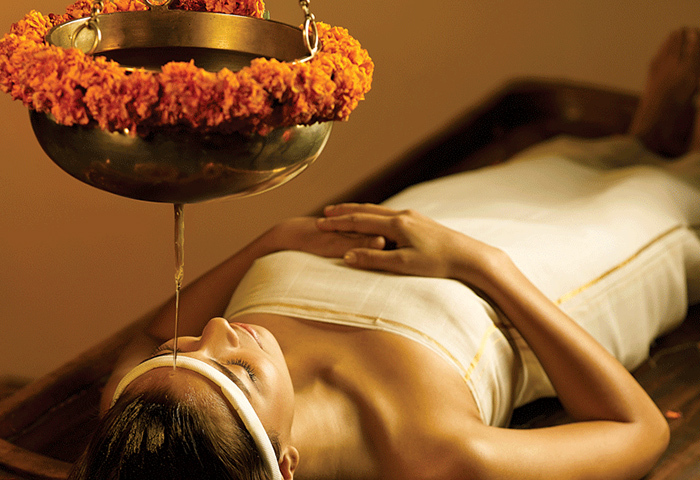 For the compromised nervous system, a great treatment is Shirodhara. Shirodhara provides help in relieving hypertension, fatigue, stress, and anxiety. This relieves headache, fear, worry, tension and depression. The moods are regulated by Shirodhara and giving feelings of relaxation and pleasure. Shirodhara treatment also prevents several psychosomatic disorders. The prevention of diseases, in healthy individuals, that are related to sense organs, mind and body is the primary indication. The practitioner of Ayurveda uses a variety of ghee and herbal oils based on his experience and wisdom. For example, Mahanarayana oil or Dhanwantram oil are usable in Vata disorders and Lakshadi oil are usable in pitta disorders. In predominance of Vata-Kapha or Vata, Kapha imbalances, generally there is use of warm oil. In case of Pitta imbalances or Pitta predominance, cool oils among other types of liquids are used. The luke warm oil can be used in Pitta disorders such as Chandan Bala Lakshadi oil. When Vata vitiation accompanies Pitta, herbal ghee in luke warm such as saraswat ghee or Brahmi ghee are usable for the shirodhara. The next type is shirodhara, indicating infusion of milk with herbs or medicated milk which is poured rhythmically on the forehead for a specific amount of time and from a specific height. This allows the milk to be running into the hair and through the scalp. Takra-dhara is used in herb with infusion of butter milk or takra poured for a specific amount of time and from a specific height rhythmically and continuously. This allows the butter milk running through the hair and into the scalp. © 2017 Ayushmaan Bhavah. All Rights Reserved.